Boxing Day is a massive public holiday in Australia and the best thing about being in Melbourne is that there are so many options for how to spend your day. From sporting events, cinema releases, shopping sprees or family BBQ’s, Boxing Day is considered by Melbournians to be one of the best days of the year. 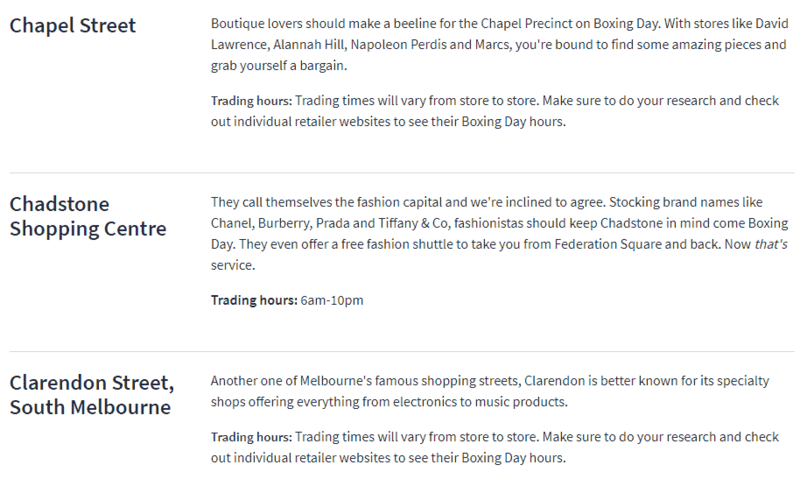 Boxing Day is, without a doubt, one of the most fun days to shop in Melbourne. Every year on the 26th of December, shops fling their doors open to thousands of customers for the biggest retail sales of the year. Many shops open earlier than usual and remain open late to allow shoppers to cash in on the sales. 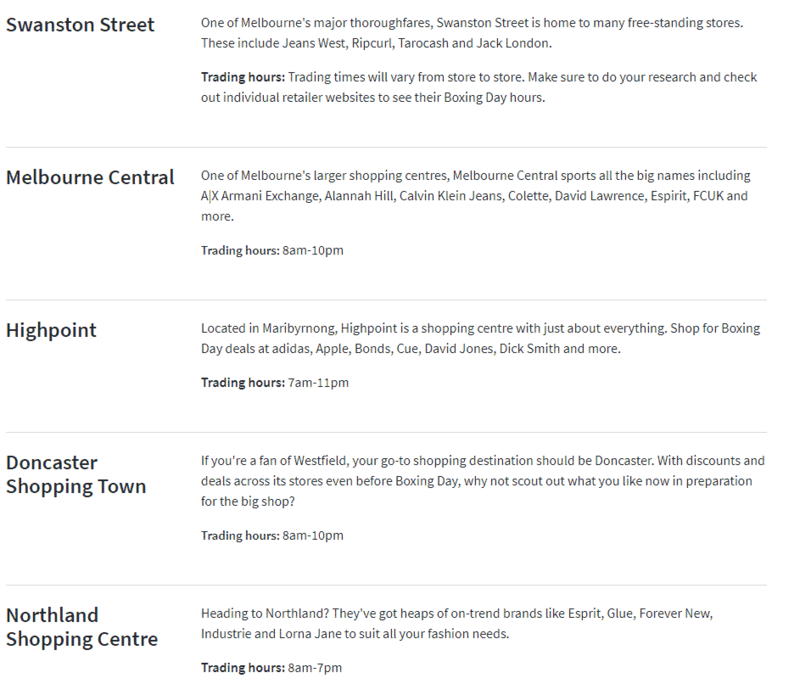 Some of the must-visit places for the best Boxing Day sales include DFO Moorabbin, Chadstone Shopping Centre, Highpoint Shopping Centre, Westfield Southland, Doncaster Shopping Town and Eastland Shopping Centre. For sports lovers, head to the MCG for the Boxing Day Test, which will be played over 5 days between Australia and Pakistan. This iconic cricket game is enjoyed not only by the Aussie fans but by many other enthusiastic cricket fans from all over the world. Every four years, the test match is played as part of the 5-match Ashes series with England. For cinema lovers, head to the movies and catch the biggest blockbusters of the year which are released on Boxing Day. Boxing Day at the movies is the busiest day of the year where millions of dollars are spent on catching these new releases with many world premieres scheduled for this day. After a busy Christmas Day, Boxing Day is often spent by Australians having a backyard BBQ or heading down to the beach for a day of relaxation. Although Boxing Day is a public holiday, most shops will be open and public transport will run on a Sunday timetable.